Limited edition gatefold 180-gram pink vinyl, pressed at RTI! The Sixties were a turbulent time in America as its disenfranchised youth looked to their musical heroes for many of its compelling questions. Jefferson Airplane with Grace Slick, Paul Kantner, Jack Casady, Jorma Kaukonen, Marty Balin, Skip Spence and Spencer Dryden provided their fans the answers with heavy guitars, powerful vocals and time honored classic sixties anthems. In 1967, The Summer Of Love was upon us and Jefferson Airplane were there to commence the festivities. 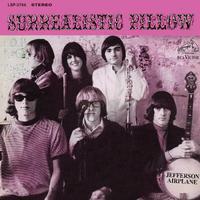 Delivering the mind bending classic Surrealistic Pillow, the chart topping platter featured two of the biggest songs of the late Sixties with "Somebody To Love" and "White Rabbit." Jefferson Airplane truly represent the acid rock era with this once in a lifetime masterpiece. Aside from the great songs mentioned above, you also get the classic rockers "Plastic Fantastic Lover," "She Has Funny Cars" and "How Do You Feel," as well as more introspective classics like "My Best Friend" and the classic "Embryonic Journey." This limited edition 180-gram pink vinyl version of the 1967 smash Surrealistic Pillow is mastered impeccably by Joe Reagoso and manufactured at RTI.